Probably the most famous trainer in the world, the "Stearman taught more WWII pilots to fly than any other airplane. Its longevity is assured by the fact that many have been restored and are still in use today. The detailed plan set consists of three large sheets which clearly illustrate all structural details. 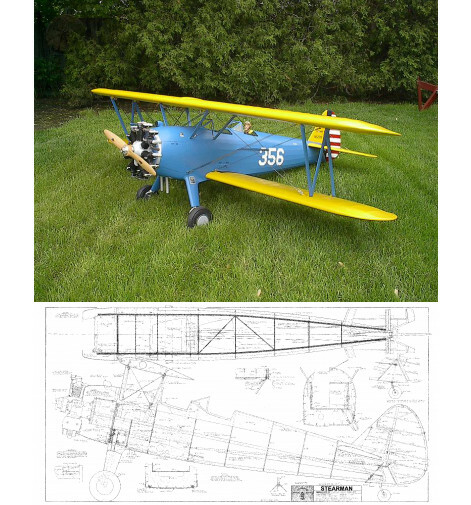 The giant scale PT-17 Stearman 87" plan set is 1/4.4 scale and consists of four large sheets that clearly illustrate all structure as well as showing installation of wing and gear struts. The PT-17 Stearman 87" plan shows the installation of Robart struts, servos and Zenoah G-62 engine and features two, two piece wings. The basic structures use conventional “modeling” tools and materials such as balsa and plywood, and the techniques are straightforward; easily accomplished by anyone with previous model building experience. There are many online building threads at www.rcuniverse.com forums and www.rcscalebuilder.com forums for Nick’s plans. Tech support is also available via email at www.ziroliplans.com or by phone 9:00 to 5:00 Mon - Fri EST 631-467-4765. The plan includes full-size templates for all the required parts allowing you to cut a complete “kit” before you start construction. 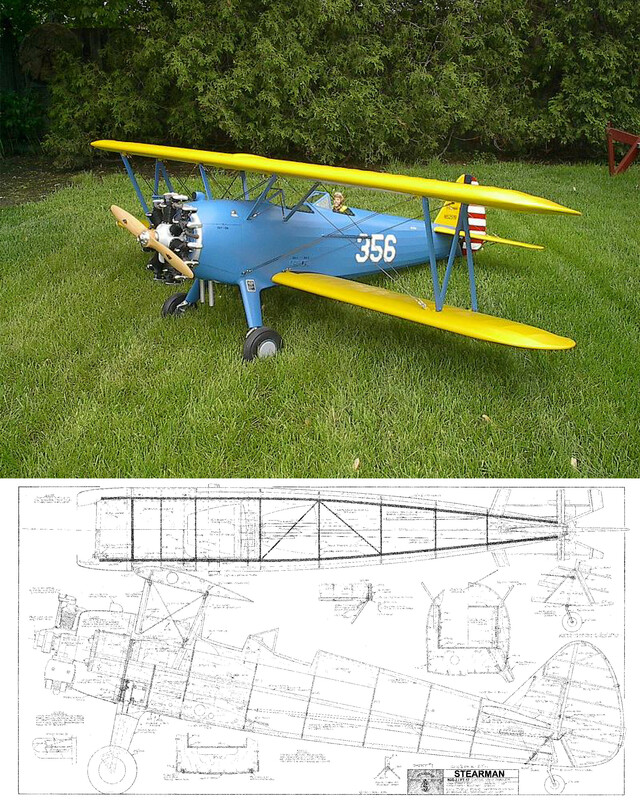 If you don’t have the tools or time to cut your own kit Nick Ziroli Plans now carries laser cut wood kits for the PT-17 Stearman 87" plan. The plans have a separate instruction guide and building notes on the plans. If you choose gear or an engine not shown on the plans you should have them on hand when you start construction to make any changes needed for mounting. Nick Ziroli Plans recommends covering the airframe with cloth such as Sits system or Solartex. 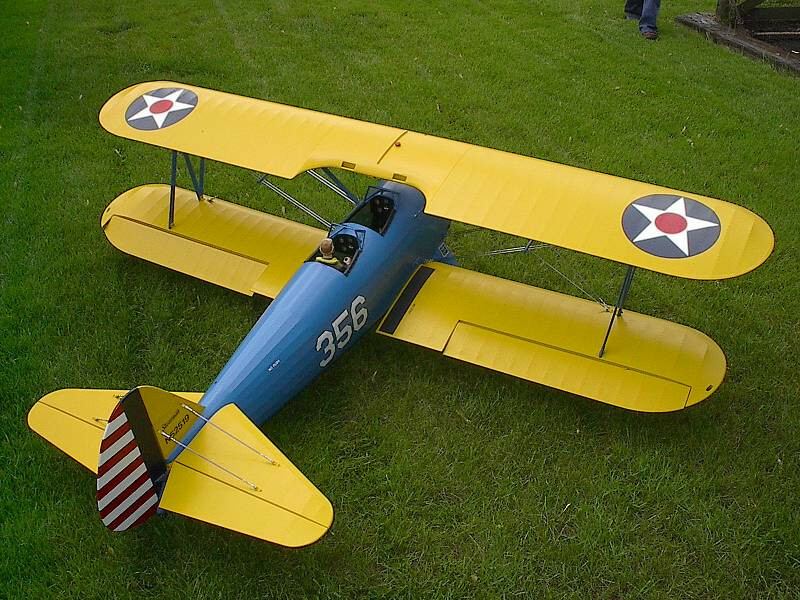 Nick Ziroli Plans has building and scale accessories available for the PT-17 Stearman 87". Wing Tube: (2) 1 1/4" X 30"